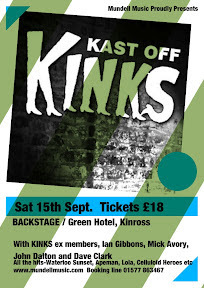 BLOG - BETWEEN A ROCK & A HARD PLACE: Kast Off Kinks kome To Kinross Again! The Kast off Kinks are former members of The Kinks who got together to play for Kinks Fan Club meetings and Charity events over 15 years ago. The current lineup decided to take the band to the fans across the country. They are Mick Avory, original drummer, who played on all the classic hits from 1964-1984. Bassist, Jim Rodford 1978-1996 (also known for Argent and the current Zombies). Ian Gibbons, keyboardist, 1979-1996, currently still working with Ray Davies' band and Dave Clarke, on vocals and guitar, previously with The Beach Boys and the Noel Redding band.